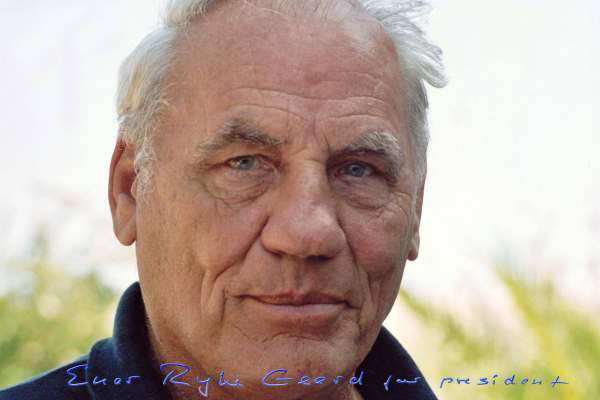 On August 18, 1978, Dr. Ryke Geerd Hamer, M.D., at the time head internist in the oncology clinic at the University of Munich, Germany, received the shocking news that his son Dirk had been shot. Dirk died in December 1978. A few months later, Dr. Hamer was diagnosed with testicular cancer. Since he had never been seriously ill, he immediately surmised that his cancer development might be directly related to the tragic loss of his son. Dirk’s death and his own experience with cancer prompted Dr. Hamer to investigate the personal history of his cancer patients. He quickly learned that, like him, they all had gone through some exceptionally stressful episode prior to developing cancer. The observation of a mind-body connection was not really surprising. Numerous studies had already shown that cancer and other diseases are often preceded by a traumatic event. But Dr. Hamer took his research a momentous step further. Pursuing the hypothesis that all bodily events are controlled from the brain, he analyzed his patients’ brain scans and compared them with their medical records. Dr. Hamer discovered that EVERY DISEASE—not only cancer!—is controlled from its own specific area in the brain and linked to a very particular, identifiable, “conflict shock”. The result of his research is a scientific chart that illustrates the biological relationship between the psyche and the brain in correlation with the organs and tissues of the entire human body. Dr. Hamer came to call his findings “The Five Biological Laws of the New Medicine”, because these biological laws, which are applicable to any patient’s case, offer an entirely new understanding of the cause, the development, and the natural healing process of diseases. In 1981, Dr. Hamer presented his findings to the Medical Faculty of the University of Tübingen as a post-doctoral thesis. But to this day, the University has refused to test Dr. Hamer’s research in spite of its legal obligation to do so. This is an unprecedented case in the history of universities. Similarly, official medicine refuses to approve his discoveries despite some 30 scientific verifications both by independent physicians and by professional associations. Shortly after Dr. Hamer submitted his thesis, he was given the ultimatum to renounce his discoveries or have his contract renewal at the University clinic denied. In 1986, even though his scientific work had never been impeached, much less disproved, Dr. Hamer was stripped of his medical license on the grounds that he refused to conform to the principles of standard medicine. Yet he was determined to continue his work. By 1987 he was able to extend his discoveries to practically every disease known to medicine. Dr. Hamer has been persecuted and harassed for over 25 years, in particular by the German and French authorities… Since 1997, Dr. Hamer has been living in exile where he carries on with his research and where he continues to fight for official recognition of his “New Medicine”. Dr. Hamer established that “every disease is caused by a conflict shock that catches an individual completely off guard” (First Biological Law). In honor of his son, Dr. Hamer called this unanticipated stressful event a Dirk Hamer Syndrome or DHS. Psychologically speaking, a DHS is a very personal incident conditioned by our past experiences, our vulnerabilities, our individual perceptions, our values and beliefs. Yet, a DHS is not a merely psychological but rather a biological conflict. Animals experience these biological shocks in concrete terms, for example, through a sudden loss of the nest or territory, a loss of an offspring, a separation from a mate or from the pack, an unexpected threat of starvation, or a death-fright. Since over time the human mind acquired a figurative way of thinking, we can experience these biological conflicts also in a transposed sense. A male, for instance, can suffer a “territorial loss conflict” when he unexpectedly loses his home or his workplace; a female “nest conflict” may be a concern over the well-being of a “nest member”; an “abandonment conflict” can be triggered by an unforeseen divorce or by being rushed to the hospital; children often suffer a “separation conflict” when Mom decides to go back to work or when the parents split up. 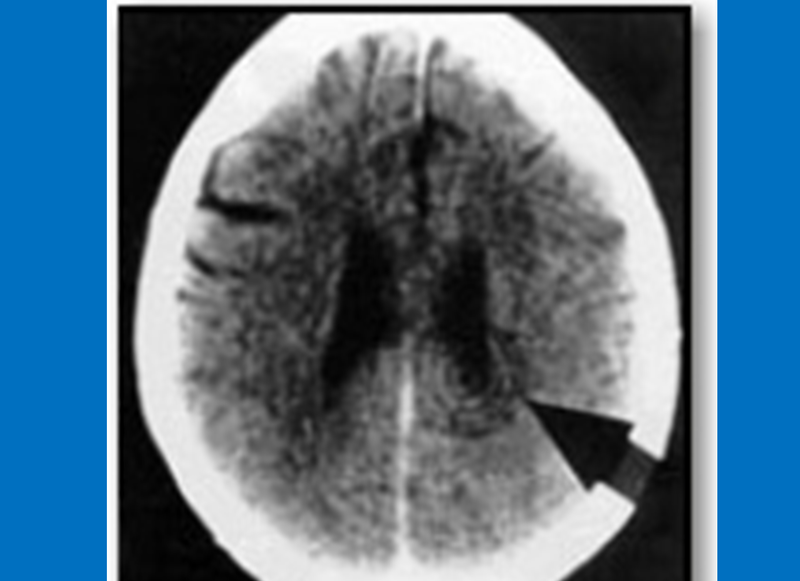 By analyzing thousands of brain computer tomograms (CT) in relation to his patient’s histories, Dr. Hamer discovered that the moment a DHS occurs, the shock impacts a specific, predetermined area in the brain, causing a “lesion” that is visible on a CT scan as a set of sharp concentric rings. (In 1989, Siemens, the German CT scanner manufacturer, certified that these ring formations are not artifacts of the equipment). Upon impact, the affected brain cells communicate the shock to the corresponding organ, which in turn responds with a particular—predictable!—alteration. The reason why specific conflicts are indissolubly tied to specific brain areas is that each part of the brain is programmed to respond instantly to conflicts that could threaten our survival. While the “old brain” (brain stem and cerebellum) is programmed with basic survival issues that relate to breathing, eating, or reproduction, the “new brain” (cerebrum) is encoded with more advanced themes such as territorial conflicts, separation conflicts, identity conflicts, and self-devaluation conflicts. Dr. Hamer’s medical research is firmly tied to the science of embryology, because whether the organ responds to a conflict by a tumor growth, by tissue meltdown, or by functional impairment is determined by the embryonic germ layer from which both the organ and corresponding brain tissue originate (Third Biological Law). GNM’s “Ontogenetic System of Tumors” illustrates that “old-brain”-controlled organs, which derive from the endoderm or the “old-brain”-mesoderm, like the lungs, liver, colon, prostate, uterus, corium skin, pleura, peritoneum, pericardium, breast glands, etc., always generate cell proliferation as soon as the corresponding conflict occurs. Tumors of these organs therefore develop exclusively during the conflict-active phase (initiated by the DHS). Let’s take lung cancer, for example: The biological conflict linked to lung cancer is a “death-fright conflict”, because in biological terms the death panic is equated with being unable to breathe. With the shock of the death-fright the lung alveoli cells, which regulate breathing, instantly start to multiply, forming a lung tumor. Contrary to the conventional view, this multiplication of lung cells is not a pointless process but serves a very definite biological purpose, namely, to increase the capacity of the lungs and thereby optimize the organism’s chance of survival. Dr. Hamer’s brain scan analyses demonstrate that every person with lung cancer shows a distinct target ring configuration in the corresponding area in the brain stem, and that each patient had suffered an unexpected death panic prior to the onset of cancer. In the majority of cases the death scare was triggered by a cancer diagnosis shock that the person experienced as a “death sentence”. Given that smoking is on the decrease, this sheds new light on the enigmatic increase of lung cancer (“The #1 Killer”) and calls into question whether smoking is per se an actual cause of lung cancer. Glandular breast cancer, according to Dr. Hamer’s findings, is the result of either a “mother-child” or a “partner worry” conflict. These types of conflict always impact the “old brain” in the area that controls the milk-producing glands. A female can suffer a mother-child worry conflict when her offspring is suddenly injured or seriously ill. During the conflict-active stress phase, the breast gland cells continually multiply, forming a tumor. The biological purpose of the cell proliferation is to be able to provide more milk for the suffering offspring and thus speed up healing. Every female human and mammal is born with this age-old biological response program. Dr. Hamer’s many case studies show that women, even when not breast feeding, developed a tumor in the breast glands from obsessively worrying about the well-being of a loved one (a child who is in trouble, a parent who is ill, or a dear friend who is a cause for concern). What has been said about lung cancer and breast cancer equally applies to all other cancers that originate in the “old brain”. Each is triggered by a specific conflict shock that activates a “Meaningful Special Biological Program” (Fifth Biological Law) which allows the organism to override everyday functioning and deal physically with the emergency situation. For each type of conflict there is a brain relay from where the particular biological program is coordinated. While “old-brain”-controlled organs generate a tumor growth during the conflict-active phase, the opposite is the case with all organs that are controlled from the cerebrum (“new brain”). Concerning the embryonic germ layer, all cerebrum-directed organs and tissues (ovaries, testicles, bones, lymph nodes, epidermis, lining of the cervix, bronchial tubes, coronary vessels, milk ducts, etc.) originate from the ectoderm or the “new-brain”-mesoderm. The moment the conflict occurs, the biologically corresponding organ tissue responds with cell degeneration. Necroses of the ovaries or testicles, osteoporosis, bone cancer, or stomach ulcers, for example, are conditions that only occur while a person is in a state of emotional distress in regards to the related conflict. As is to be expected, the tissue loss has a biological significance. Let’s take, for example, the tissue of the milk duct lining. Since the squamous epithelial lining of the milk ducts developed at a much later time than the milk-producing glands, this younger tissue is controlled from a younger part of the brain, namely, the cerebral cortex. The biological conflict of the milk duct lining is a “separation conflict” experienced as if “my child [or my partner] was torn from my breast”. A female mammal can suffer such a conflict when her offspring is lost or killed. As a natural reflex to the conflict the tissue of the milk duct lining starts to ulcerate. The purpose of the tissue loss is to increase the diameter of the ducts, because with enlarged ducts the milk that is no longer used can drain off easier and doesn’t get congested in the breast. Every woman’s brain is programmed with this biological response. Since the female breast is, biologically speaking, synonymous with caring and nurturing, women suffer such a conflict by unexpected separation from a loved one they intensely care for. There are virtually no physical symptoms during the conflict-active phase, except occasional light “pulling” in the breast. Dr. Hamer also discovered that, provided there is a resolution of the conflict, every disease proceeds in two phases, (Second Biological Law). During the first, or conflict-active phase, the entire organism is geared to dealing with the conflict. While a meaningful cell alteration runs its course on the physical level, the psyche and the vegetative autonomous system also try to handle the unexpected situation. Switched into a stress state (sympathicotonia), the mind becomes completely pre-occupied with the conflict contents. Sleep disturbances and lack of appetite are typical symptoms. Biologically speaking, this is vital, because the focus on the conflict and the extra waking hours provide the right conditions for working through the conflict and finding a resolution. The conflict-active phase is also called the “cold phase”. Since the blood vessels are constricted during stress, typical symptoms of conflict activity are cold extremities (particularly cold hands), the shivers, and cold sweats. The intensity of the symptoms is naturally dependent on the magnitude of the conflict. If a person remains in an intense conflict-active state over a long period of time, the condition can be fatal. But Dr.Hamer proves beyond reasonable doubt that an organism can never die of cancer, in and of itself. A person can die as a result of mechanical complications of a tumor that, for example, occludes a vital organ such as the colon or the bile ducts, but in no way can cancer cells, as such, cause death. In German New Medicine the distinction between “malignant” and “benign” cancers is entirely meaningless. The term “malignant” is an artificial construct (the same applies to tumor markers) that simply indicates that the activity of cell reproduction has exceeded a certain arbitrary limit. If a person dies during the conflict-active phase, it is usually because of energy loss, weight loss, sleep deprivation, and emotional and mental exhaustion. Often, it is a devastating cancer diagnosis or a negative prognosis—“You have six months to live!”—that throws cancer patients (including their loved ones) into a state of despair. With little or no hope, and deprived of their life-force, they waste away and eventually die of cachexia, an agonizing process that conventional cancer treatment will only accelerate. If the patient has not undergone any conventional treatment (especially chemotherapy or radiotherapy), GNM has a success rate of 95 to 98 percent. Ironically these statistics for Dr. Hamer’s remarkable success rate were delivered by the authorities themselves. When Dr. Hamer was arrested in 1997 for having given three people medical advice without a medical license, the police confiscated his patients’ files and had them analyzed. Subsequently, one public prosecutor was forced to admit during the trial that, after five years, 6,000 out of 6,500 patients with mostly “terminal” cancer were still alive. With conventional treatment the figures are generally just the reverse. According to epidemiologist and biostatistician Dr. Ulrich Abel (Germany), “Success of most chemotherapies is appalling…There is no scientific evidence for its ability to extend in any appreciable way the lives of patients suffering from the most common organic cancer… Chemotherapy for malignancies too advanced for surgery, which accounts for 80% of all cancers, is a scientific wasteland.”(Lancet 1991). The resolution of the conflict signals the beginning of the second phase of the biological program. Our emotions and our organism switch immediately into a healing mode assisted by the vegetative system’s switch into “vagotonia”. During the healing phase the appetite returns, but we are very tired (we might not even be able to get out of bed). Rest and supplying the organism with nutrients are essential while the body is trying to heal. The second phase is also called the “warm phase”, as during vagotonia the blood vessels are enlarged, causing warm hands, warm feet, and warm skin. With the resolution of the conflict there is also an instant change at the organ level. Cell proliferation (“old-brain”- controlled tumor growth) or cell meltdown (“new-brain”-controlled tissue loss) immediately comes to a halt, and the appropriate repair process is set in motion. An area that necrotized or ulcerated during the conflict-active phase is now being refilled and replenished with new cells. This is usually accompanied with potentially painful swelling, caused by an edema that protects the tissue while it is healing. Other typical repair symptoms are hypersensitivity, itching, spasm (if muscle tissue is involved), and inflammation. Examples of “diseases” that only occur in the healing phase are: certain skin disorders, hemorrhoids, laryngitis, bronchitis, arthritis, atherosclerosis, bladder or kidney disorders, certain liver diseases, and infections (see below). Based on the observation of cell multiplication (mitosis) and the standard distinction between “benign” and “malignant” tumors, conventional medicine interprets the natural cell production of healing tissues as a “malignancy”. In GNM we likewise distinguish two types of tumors. But the tumors are not divided into “good” and “bad” ones; rather they are classified according to their tissue type and the part of the brain from which they originate and are controlled. There are those tumors which develop exclusively during the conflict-active phase (lung tumor, colon tumor, liver tumor, uterus tumor, prostate tumor, etc.) and, conversely, those that result from the natural repair process. As with “old-brain”-controlled cancers, the tumor growth is neither accidental nor meaningless since the cell proliferation stops as soon as the tissue is mended. Testicular cancer, ovarian cancer, lymphoma, non-Hodgkin’s lymphoma, various types of sarcoma, bronchial and laryngeal carcinoma, and cervical cancer are all of a curative nature and are exclusively phenomena of the healing phase. Provided that the healing process is not interrupted through medication or a conflict relapse, these tumors eventually degrade during the completion of the healing phase. The second type of breast cancer, the “ductal carcinoma in situ” (DCIS), also falls into this category. While a glandular breast cancer is an indication that a woman is in the active phase of a worry conflict, an intra-ductal cancer is a positive sign that the related separation conflict (“torn from my breast”) has been resolved. A woman doesn’t develop breast cancer without a reason! Neither does she develop breast cancer by coincidence in precisely her right or left breast. Another aspect of Dr. Hamer’s research has been the role of microbes during disease development. This, in brief, is what he found (Fourth Biological Law): Microbes such as fungi, bacteria, and viruses are only active during the healing phase, and the manner in which they operate is fully in accordance with evolutionary logic. Tubercular bacteria, for example, populate only “old-brain”-controlled tissues. Their function during the repair phase is to decompose tumors that are now superfluous, e.g., lung tumors, colon tumors, kidney tumors, prostate tumors, uterus tumors, breast gland tumors, melanomas, and mesothelioma. Tubercular bacteria are essential for breaking down the buildup of “disposable cells” that proliferated for a biological reason during the conflict-active phase. If the required bacteria are not available, due to vaccination, overuse of antibiotics, or chemotherapy treatment, the tumor cannot disintegrate properly. As a result, it stays in place and encapsulates harmlessly. Detected in a routine check-up, however, such an encapsulated growth can lead to a “cancer” diagnosis and, potentially, new conflict shocks with new symptoms. By understanding the biological laws of disease development this prospect can be virtually eliminated. While bacteria break down tumor cells that are no longer needed, viruses appear to be involved in the healing process of—exclusively—cerebral-cortex-controlled tissues (e.g., bronchia, nasal membrane, stomach lining, lining of the bile ducts, and epidermis). Hepatitis, pneumonia, herpes, influenza, and stomach flu, are indications that a “virulent” but natural healing process is running its course… The dilemma in which conventional medicine finds itself is that by failing to recognize the two-phase pattern of every disease, the first, conflict-active phase, routinely gets overlooked. Since microbes are only active during the healing phase, and since the activity of microbes is typically accompanied by swelling, fever, pus, discharge, and pain, microbes are considered malevolent and the cause of infectious diseases. But microbes do not cause the disease. After all, it is our organism that employs the microbes to optimize the healing process. Microbes can, of course, be transmitted, but they remain dormant until the person is in the healing phase of the same type of conflict. Based on GNM’s “Ontogenetic System of Tumors”, the widely propagated theory of metastasis that suggests that cancer cells travel through the blood or lymph vessels and cause cancers at new sites is, in Dr. Hamer’s words, “pure academic fiction”. Cells in general and cancer cells in particular can under no circumstances change their histological structure or cross the germ layer threshold. For example, a lung tumor cell, which is of endodermal origin, controlled from the brain stem (“old brain”), and which proliferates during the conflict-active phase cannot transform itself into a bone cell, which is of mesodermal origin, controlled from the cerebrum (“new brain”), and which deteriorates during a conflict-active decalcification process. In the scenario “lung cancer metastasizes into the bones”, the lung cancer cells would actually be creating a hole (i.e., cell meltdown!—the reverse of a cancer) in some bone in the body. We also have to ask ourselves why cancer cells rarely “spread” to the closest neighboring tissue, e.g., from the uterus to the cervix. If cancer cells travel via the blood stream, why is donated blood not screened for cancer cells? Why are there not multitudinous tumors found in the walls of the blood vessels of cancer patients? Dr. Hamer does not, of course, dispute the fact of second cancers, but these subsequent tumors are not caused by migrating cancer cells that miraculously transform into a different cell type, but rather by new conflict shocks. New DHSs can be initiated by additional traumatic life experiences or through diagnosis shocks. As already mentioned, an unexpected diagnosis of cancer, or being told that it is “metastasizing” can trigger a death-fright (causing lung cancer) or any other type of diagnosis-related shock, causing new cancers in other parts of the body. In many cases these patients don’t make it into the healing phase, because the severe state of stress weakens them to a point where they have very little chance of surviving the highly toxic chemotherapy treatment. The second most frequent cancer after lung cancer is bone cancer. Dr. Hamer found that our bones are biologically linked to our self-esteem and our self-worth. Thus, being told one has a “life-threatening illness”, especially one that allegedly “spreads like wildfire” through the body, is equated with: “now I am useless”, and the bone(s), next to where we feel “useless” start to decalcify (in the case of breast cancer often in the area of the sternum or the ribs). Just as with a fractured bone, the purpose of the biological program (of the “disease”) appears at the end of the healing phase. When the repair phase is completed, the bone will be much stronger at that site, thus assuring that we are better equipped for the eventuality of a new “self-devaluation conflict”. Once the conflict has been resolved, the brain lesion—along with the psyche and the organ—also enters the healing phase. As with any wound that is being repaired, an edema (excess fluid) develops to provide protection of the recovering neural tissue. On the brain scan the changes are clearly noticeable: the sharp target rings submerge in the edema and appear now as blurry, indistinct and dark. At the height of the healing phase, when the brain edema has reached its maximum size, the brain triggers a brief, strong push that expels the edema. In GNM terminology, this counter regulation is called the “Epileptoid Crisis” (EC). 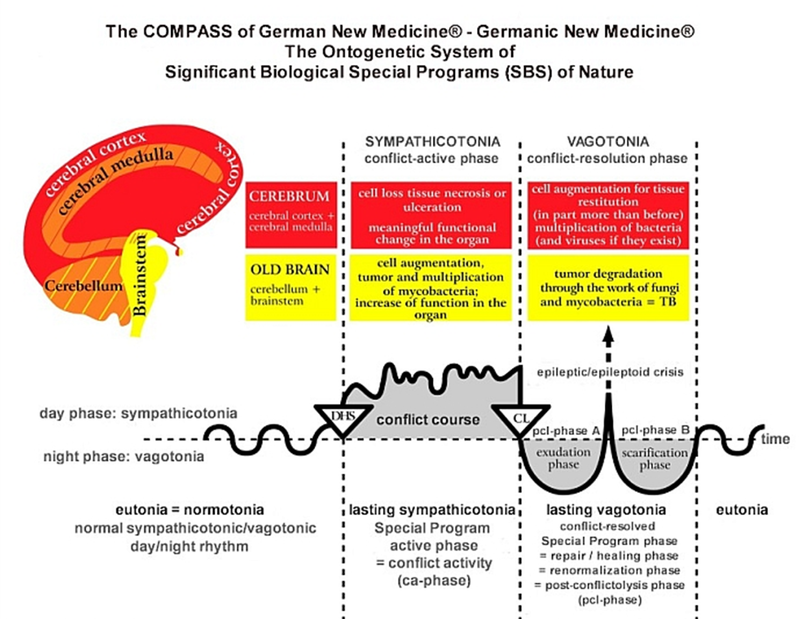 During this crisis, the entire organism is thrust briefly into a state of sympathicotonia, i.e., re-living the typical symptoms of the conflict-active phase such as cold sweats, cold extremities, a fast heartbeat, and nausea. The intensity and duration of this pre-programmed crisis is determined by the intensity and the duration of the preceding conflict. Heart attacks, strokes, asthma attacks, and epileptic seizures are just a few examples of this crucial turning point. The type of “crisis” always depends on the nature of the conflict and the precise brain area involved. After the brain edema has been pressed out, neuroglia, which is brain connective tissue that provides structural support for neurons, assembles at the site to restore the function of the nerve cells that were affected by the conflict shock (DHS). It is this natural glia accumulation that conventional medicine labels as a “brain tumor”, with often dire consequences for the patient. Dr. Hamer established already in 1981 that a “brain tumor” is not a disease in itself, but symptomatic of a healing phase that runs parallel in the organ (controlled from the correlated area of the brain that is simultaneously undergoing the repair phase). “Metastatic brain cancers”, therefore, do not exist either. The very first step in GNM therapy is to provide an understanding of the biological nature of a symptom, e.g., a certain cancer, in relation to its psychical cause. A brain scan and a thorough medical history are vital to determine whether the patient is still conflict-active or is already healing. If still in the active phase, the focus is to identify the original DHS and to develop a strategy to resolve the conflict. It is crucial to prepare the patient for the healing symptoms and for potential complications. These symptoms are very predictable! Dr. Hamer’s findings provide us —for first time in the history of medicine—with a reliable system that allows us not only to understand but also to predict the development and symptoms of each and every disease. This is real preventive medicine, an aspect of German New Medicine which can hardly be emphasized enough. True prevention requires an understanding of the real cause of a disease, and that is what Dr. Hamer’s research supplies in splendid detail. By understanding the “Five Biological Laws” of the cause and healing process of disease we can free ourselves from the fear and panic that often come with the onset of symptoms. This knowledge is more than power, it can save lives. I finally had to ask myself whether our understanding and our concept of disease had not been entirely wrong because of our ignorance of the biological purpose of disease. We believe that the body was created by God to heal from all symptoms, conditions and diseases and if the 7 Basic Steps to Total Health are lived and the stored mental/emotional toxins (lies), traumas and shocks are replaced with Truth then vibrant health of body, mind and emotions can be regained. It is our belief at Total Health Institute that the body, created by God, can naturally heal when the proper internal and external environment is produced. We never have and never will treat any symptom, condition or disease. Our purpose is to promote total health of the body, mind and spirit through natural treatments and therapies along with teaching the 7 Basic Steps to Total Health™ lifestyle and the Truth to set each person free from incorrect learned knowledge about health and healing. 1. Excessive thought activity in the brain, this can actually cause the brain cells to be destroyed because of the mental/emotional stress. 2. The possible associated organ that the brain area supplies can also be effected thus causing symptoms, conditions and diseases. One of the ways to complete the healing so that the body can once again be in total health and not fall into chronic recurring symptoms, conditions and diseases is to find and resolve the original mental/emotional traumas or shocks by replacing the lies with Truth.